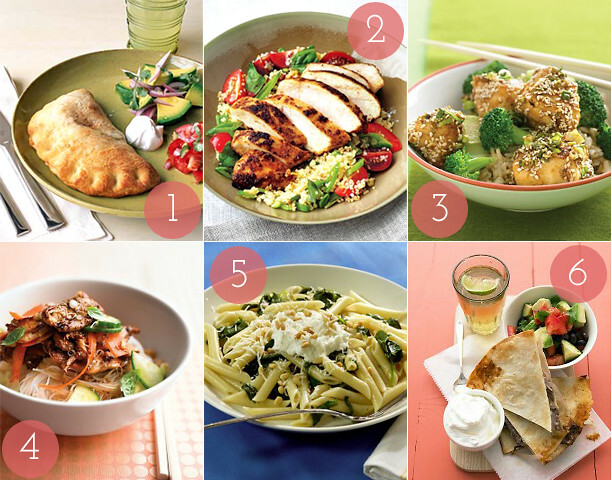 simplicities & serendipities: list twenty: dinners to try. list twenty: dinners to try. Jeffrey and I often find ourselves in what we call the dinner rut: A period of time in which five or six meals are in constant rotation. That's fine sometimes, but it's a shame to get sick of well loved meals because of eating them too often. Occasionally, I get in the mood to scour Martha Stewart or Real Simple for recipes that fit our tastes and lifestyle. I'm not kidding when I say I could spend hours doing this. Since we are embarking on a new year, I think now is a better time than ever to make a new list of fun and fresh meals to test out within these next few weeks. 2. Spiced Chicken + Couscous Salad. 4. Thai Chicken & Noodle Salad (with Spicy Asian Dressing). 5. Penne with Ricotta and Pine Nuts. Honorable Mentions: Skirt Steak and Bok Choy Stir Fry, Kitchen-Sink Quesadillas, Slow-Cooker Orange Chicken with Potatoes, Slow-Cooker Vegetarian Chili with Sweet Potatoes, and Slow-Cooker Pulled-Pork Tacos. your blog is adorable!! follow me? im following youu!! that is an awesome idea - i agree its so easy to get into a rut. i want to try and make one really challenging food a month. Sorry it's been so long since I've stopped by but I love to see Simplicities and Serendipities up and running again! Looks like you've had a lovely holiday season and have some great meals to look forward to... that Sesame Chicken looks especially scrumptious! I definitely get in food ruts from time to time so I understand the desire to try something new - hope you find some new favorites! The steak quesidillas look so good! Good luck trying all these out!